Both of these scare the crap out of me. And then it came to me – a trip I would want to take where I would take pictures but not video: The American West. Las Vegas, Nevada – gamble a bit – drop off car – fly home. Google says it is 3,884 miles and 70 hours of driving. Now there are some complications. First – most car rental companies don’t let you drive one-way across state lines – in fact only Budget Rental Car appears to allow you to go from Bozeman to Vegas (and not the other way around – I checked). Second – this is the American west – there aren’t hotels – let alone even cities everywhere. 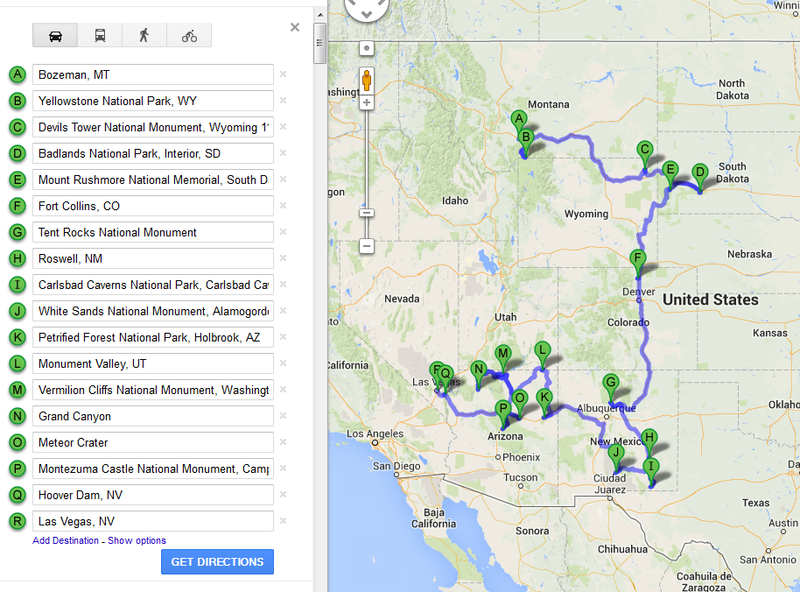 So I went back and mapped out cities which had hotels such as Spearfish, SD and Tuba City, AZ. All in all – a glorious 22 days of driving and shooting. I know some of you are thinking this would be cheaper and more fun in a camper but I am not that kinda guy – I need a hotel at night. So there it is my grand tour of the American West – not this year but hopefully soon!